Diehard Fiery Furnaces fans must be a broke and exhausted bunch, what with the insane amount of content constantly being released. Not only did they just release their latest album I'm Going Away, but they're also planning a fan-written record and two cover albums of I'm Going Away, not to mention whatever surprises they pull out next. 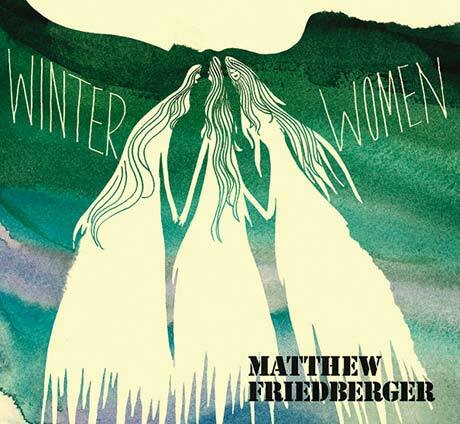 To add to the heap of content, Thrill Jockey has announced that the label will be reissuing Fiery Furnace dude Matthew Friedberger's 2006 solo double album, Winter Women/Holy Ghost Language School. On top of the album's original 29 tracks, the reissue will come with four bonus tracks. So, you know, cancel your plans, because you've got some listening ahead of you. Winter Women/Holy Ghost Language School will be out on September 29, with the new album art above. 1. "Under The Hood At The Paradise Garage"
2. "The Pennsylvania Rock Oil Company Resignation Letter"
6. "Big Bill Crib and His Ladies of the Desert"
10. "Theme From Never Going Home Again"
13. "I Love You Cedric"
2. "Holy Ghost Language School"
3. "The Cross and The Switchblade"
4. "I Started Drinking Alcohol at the Age of Eleven"
5. "Do You Like Blondes?" 7. "Topeka and San Antonio"
8. "A Mystical Preparative To Lewdness"
9. "Ship Scrap Beach Business"
10. "First Day of School"
11. "Things Were Going So Well"
12. "All In Vain or The Opposite"
Exclusive: Fiery Furnaces' Matthew Friedberger Explains His Explanation About Radiohead "Feud"